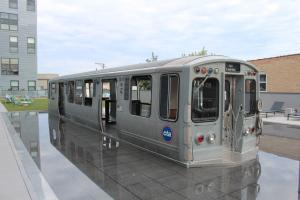 Want to hang out with your neighbors in an old CTA train car? 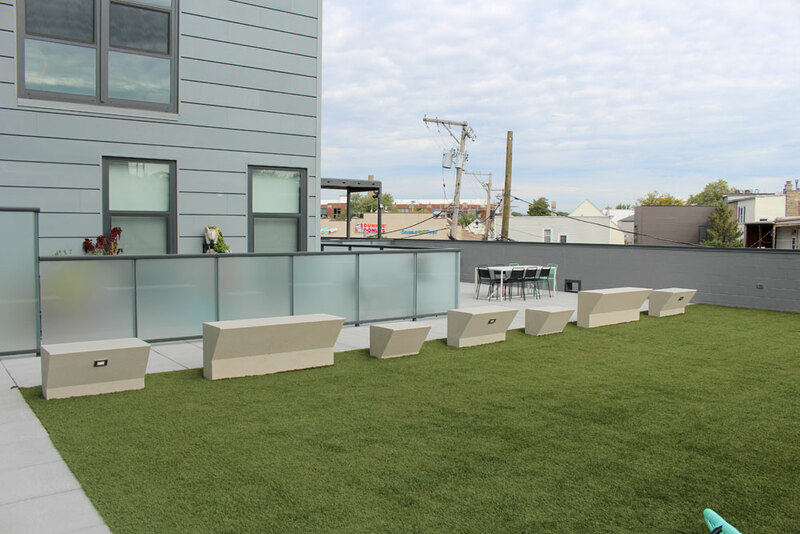 Want to cookout and share a craft beer or wine with friends at the concrete bar just up the steps from your apartment? 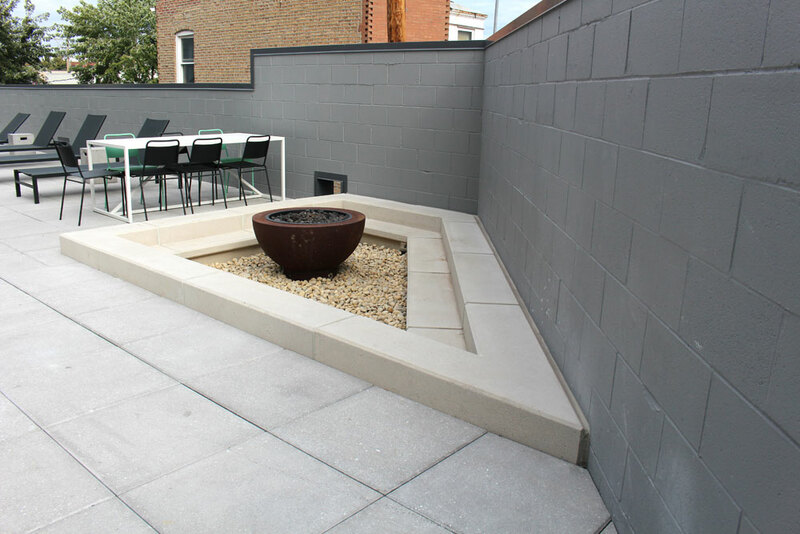 Feel like telling stories around the fire on the second floor deck? 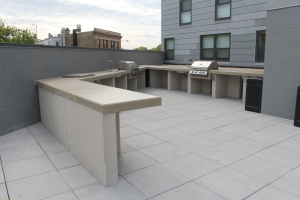 Residents at the Logan Square L luxury apartments in Chicago (http://logansquarel.com) can do all of the above after the completion of a project that Doty & Sons was proud to be a part of. In March, we were contacted by a project manager from ARCO/Murray National Construction (http://www.arcomurray.com) about designing and manufacturing custom products for an ambitious project. If we decided to accept this job, we would need to create custom forms for a bar/grilling area, a fire pit seating area, and multiple benches, including one 33 feet in length. Jobs of this scope typically require 10-12 weeks or more to plan and execute. These products were needed in 6 weeks. When we received the official purchase order on March 22, Tom Doty and Matt Rotramel created a production schedule, started drawing the components in CAD, and ordered all of the necessary materials. 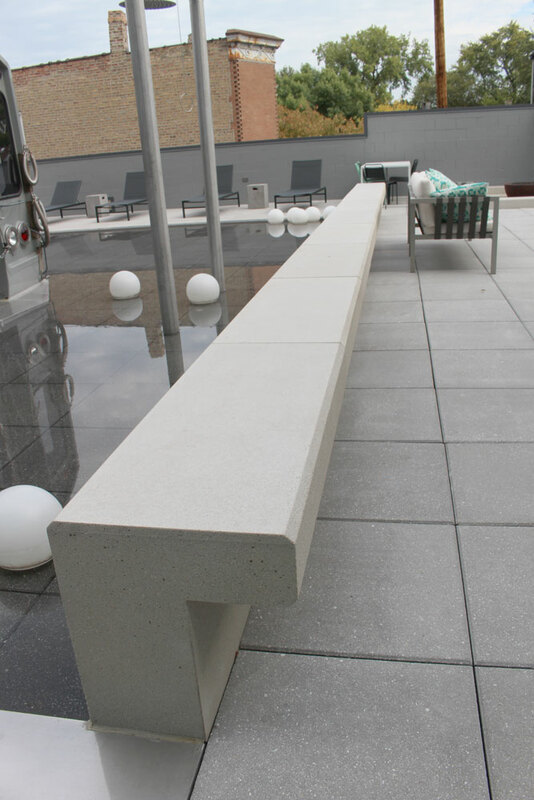 By April 8, we shipped the first load of concrete benches. 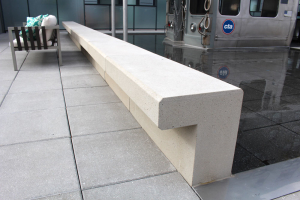 These benches were cast in sections then placed end to end, creating a continuous 33-foot-long bench. Each section required anchoring angles and custom pipe fittings for water feature jets. Custom made bench 33 feet long. Cast in sections. Custom bench. Shown with CTA train in background. 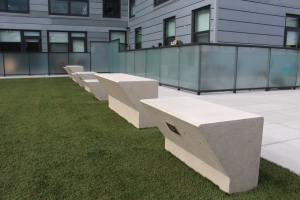 Custom made concrete bench. 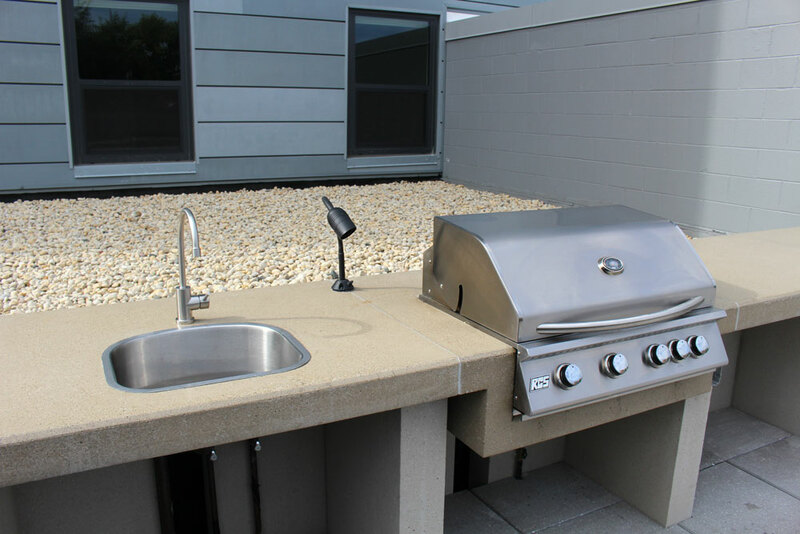 Back view showing grilling area and bar in background. 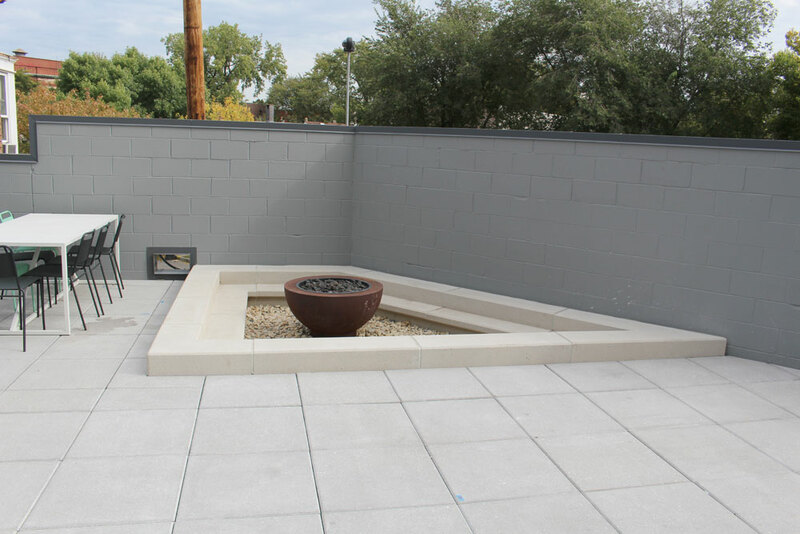 The fire-pit seating area required four forms: one straight section, one 90 degree corner section, one angled section, and one “pointed end” section. An electrical component was necessary for the LED lighting that would be installed later. Concrete Fit Pit Seating Area. Custom made fire pit seating area. 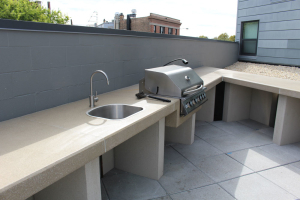 The bar/grilling area included base pieces and the top sections. 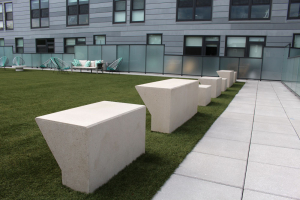 The shape created several challenges, requiring detailed CAD drawings of each piece. Some of the base pieces required electrical conduit for outlets. The top pieces included special sections for sinks, grills, and coolers. We were a bit concerned about the concrete countertops getting stained. 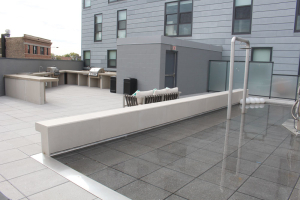 Unless concrete is sealed properly, wine and acidic materials can easily stain the surface. We decided to seal the surface with a highly-recommended sealer manufactured by Versatile Building Products, PolyTop 50/50. Grill and Sink shown at Logan Square L Apartments. 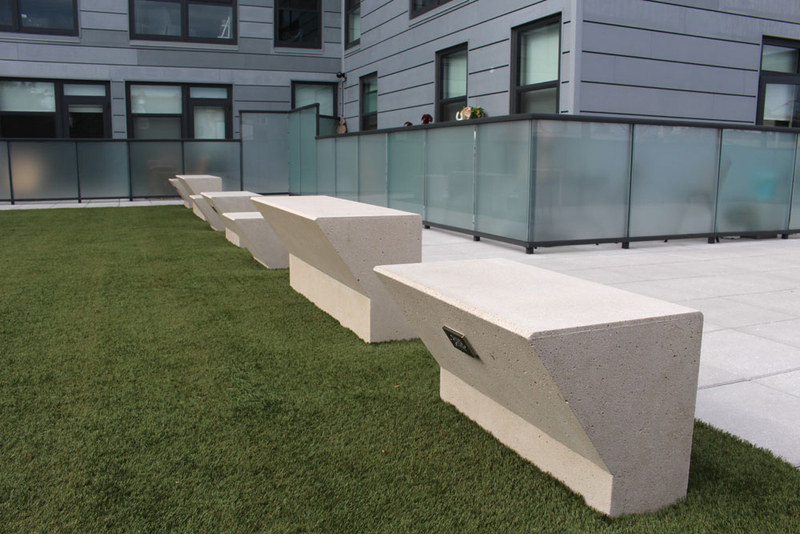 For the north side seating area featured three benches of the same style, but in different lengths and heights. This variation in height created a unique look. Back view of north benches. 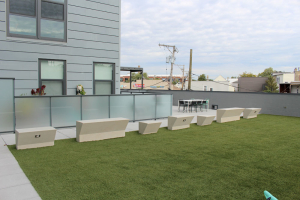 Custom benches on north side or patio deck. 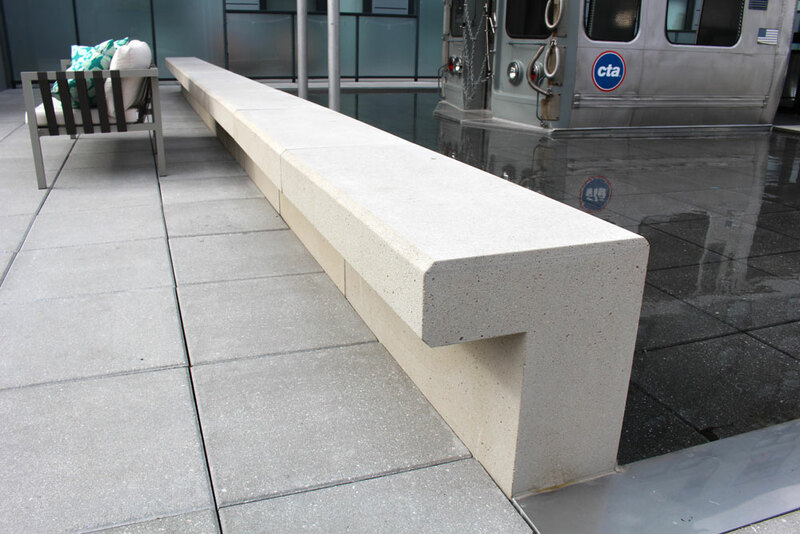 All of the pieces for this project were cast in Doty & Sons C2 finish, a light sandblast finish, limestone in color, that we seal with a non-gloss sealer. 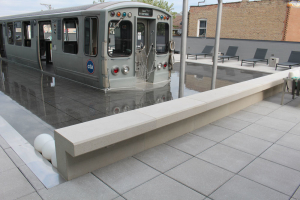 CTA train on second floor outdoor patio deck at Logan Square L Apartments.